Basemaps are a great way to add some color and vibrance to your weather maps. This tutorial will show you how to make a basemap in GrADS, using topography data from the GrADS Data Sever, and the basemap scripts from the Script Library. The basemap we will make is shown below, and is the same basemap used in the basemap overlay tutorial. So, for this tutorial you must download the following files from the script library. In addition to these scripts you must also have the color.gs script in your script folder. Once you have all these scripts, you are ready to begin! Now, basemaps are fairly easy to make, and can essentially be boiled down to three simple steps. Step 1: Set a Domain. 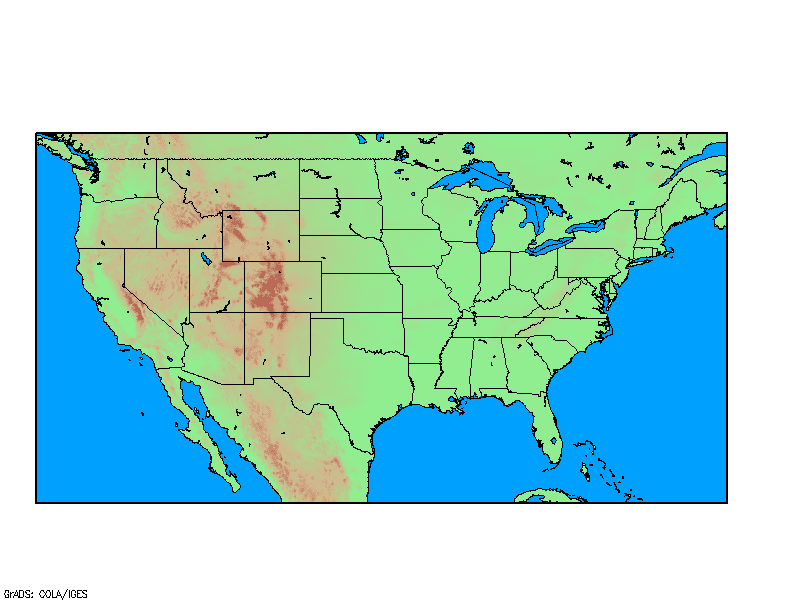 Now that our file is open, we will type in a couple of generic commands, so to set the background color to white and print a high resolution map when we display our variable. Now to set the actual domain. So, to make the image above, we will set the domain for the United States. We will do this using the 'set lat' and 'set lon' commands. Now that we have our area, we can move on to step two. int=(4100-200)/50 ;*int sets the interval used for topography, this scale sets 50 intervals. Once the color scale is set, simply display the variable. Now, our basemap is starting to take shape and we are set to move on to the final step. This is the last step, and the only step that involves the use of basemap.gs. In this command, the O stands for Ocean, so the script will fill in bodies of water. The two numbers correspond to the fill and outline colors respectively. 11 for medium blue and 1 for black. Lastly, the H stands for high resolution, so this will use the file opoly_hires.asc to fill in the ocean. Now, that you have a nice looking basemap, all thats left is to save the image using the 'printim' command. Be sure to specify the image dimensions, so that you can match them later when you save GrADS output over your basemap. And that's it, that's all there is to it! You now have a nice, elegant basemap to serve as a background for your GrADS output. To learn more how to output GrADS data onto your basemap, check out this tutorial. Hi there ! I just asking .. what will I do if the command basemap says "sh: bash: command not found. error in reading opoly_mres.asc." im using grads 2.0.a9.oga.1? thanks ! I think your problem is you either don't have the file "opoly_mres.asc" or you don't have it in the right folder. I would start by double checking that this file is in your GrADS directory, and if not you can get it from this link: http://www.iges.org/grads/gadoc/library.html. I am almost certain this is your problem. I don't know of any poly_hires.asc for Africa. If I were you, I would run use the opoly_mres.asc to make your basemap, and then to up the quality of the image, I would open it in paint and touch up the edges around the coastlines. I've done this before, and it works pretty well. I sometimes see that error, it usually has to do with internet connections. If you haven't already try again. Sorry for the delayed response! Hi, I´m trying to do a basemap for a small area in south america but the link doesn´t work (might have expired?). Can you please help? I got to download ETOPO5.dat from NCEP website but still can´t figure it out. also tried with shapefile but I don´t know how to use it. Hi!, im trying to fill the water areas using the basemap.gs, but it says "sh: bash: command not found. error in reading opoly_mres.asc. ", i have already downloaded the opoly_mres.asc file and put it in the same folder as basemap.gs script, but it still didnt work, can you please help ? thanks in advance! Hi, thanks so much for your blog. It is so great. I am actually working on correlate an observation data (.ctl file 1 variable) with a 10 days forecasts data (.ctl file 10 variable per day). I am so confuse about how to make that kind of correlation.